Will Liberal Democrats Undermine Mary Burke? Opposition to a pro-business Democrat could help Walker win reelection. For years, the standard political strategy included the “pivot.” First a candidate would aim to win a party’s nomination by appealing to its base. Once the nomination was secured, the candidate would pivot towards the center to appeal to less ideological voters. While some in the party’s base would be miffed, wiser heads would point out it was better to win with a watered-down agenda than lose with a perfect agenda. Generally each party’s base would go along with this strategy, if grumpily muttering that there was no real difference between the parties. The 2008 presidential campaign was a sign the paradigm had shifted. By late spring John McCain had sewn up the Republican nomination even as Barack Obama and Hillary Clinton continued duking it out in the Democratic primaries. If history was a guide this should have given McCain a substantial advantage. He could spend his extra time making the pivot for the fall campaign, reintroducing the McCain persona that had previously made him the most popular Republican senator among Democrats and independents. Instead he was compelled to spend the late spring and summer trying to win support from the Republican base. The base’s rebellion was not settled until he selected Sarah Palin as his Vice Presidential candidate, a decision that may have sealed his doom as a candidate. Instead of winning by occupying the center, the new paradigm is winning by motivating one’s base. The battle becomes one of turnout rather than winning undecided voters, and the candidate with the most enthusiastic base wins. However, Walker’s anti-Trek campaign makes sense if viewed as the next stage in the evolution of the battle of the bases, as Bruce Murphy pointed out. It is not enough to motivate one’s own base; one needs to demotivate the opponent’s. Rather than simply hoping for a rebellion among the opponent’s base, like the one Obama benefitted from in 2008, you actively promote that rebellion. But the Walker anti-Trek strategy did not originate with the official Walker campaign. Instead, it started with two web sites run by Republican organizations. In fact even today the Walker campaign’s official web site mentions neither Mary Burke nor Trek. The first of these is run by the Republican Governors Association headed by Chris Christie. It includes a web page titled “Mary Burke: Doomed From The Start” with links to articles by and about Democrats who complain that Burke is too moderate and too business-oriented. The theme of this site is that Burke is doomed because the Democratic base doesn’t like her. Except for the mention of Act 10, these became Walker’s talking points as well. The two Republican web sites suffer from message confusion. Is Burke too far left and too subservient to unions? Or is she insufficiently left and insufficiently supportive of rolling back Act 10? The sites manage to argue both positions. Another Walker theme, echoed by other pages on the maryburke.com site, is that Burke was a dilettante in business—she took a break to go snowboarding—rather than a serious contributor to Trek’s success. Yet the same site links to an article entitled The real Mary Burke: How longtime friends and business partners describe her, which reports on interviews with friends, colleagues, and a startup business she volunteered to mentor. All describe Burke as smart, astute, and generous with both her time and money. Her former business partner quotes a mutual friend: “He said, ‘If I was living in a log cabin on the prairie and we were being attacked by bandits, the one person I’d want with me is Mary Burke.” One is left wondering if anyone bothered to read the article before linking to it. There are other signs of message confusion. For example, the Wisconsin GOP site shows a billboard that apparently accuses Burke of outsourcing Wisconsin coal mining jobs, even using a stock photo of a Russian coal miner. To what extent is the Democratic base likely to punish Burke the way the Republican base punished McCain? All the quotes on the Doomed from the start web page date from 2013, when the Democratic nomination was still up in the air. A look through more recent commentary from the same sites and authors suggest that most, but not all, have lined up behind Burke. Evidently Chris Abele has now assumed the role of most-hated fellow Democrat. On the whole it appears that Wisconsin’s Democratic base is acting more like a traditional party base that closes ranks once the candidate is chosen, rather than the Tea Party which insists it gets its way or stays home. Could Hulsey’s 17 percent vote share in the Democratic primary, however, indicate residual unhappiness with Burke? There is clearly an anti-business undercurrent to many of the earlier liberal criticisms of Burke, which Walker echoes. An implication of some of the criticisms is that Trek should have ignored competitive pressures and continued making most of its bikes in Wisconsin even at the risk of going out of business. The second charge, that Trek did not pay taxes seems to betray a willful ignorance of what it means to be a subchapter S corporation. The left’s hostility to business lends credence to efforts by Walker supporters to shift the blame for sluggish job growth to Wisconsin’s business climate. It is also out of step with the views of Wisconsin voters, including those who vote Democratic. While there has been a lot of attention recently to polarization in Wisconsin, there are still areas of agreement between voters on both sides. 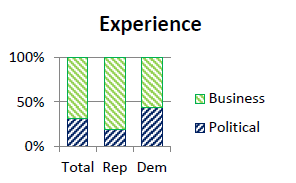 One is that they prefer business experience to political experience in their governor, as reflected in the May 2014 Marquette poll. The preference for business over political experience helps explain why Republican attacks on Burke started so early. They, unlike some of the Democratic base, regarded her business background as making her the most dangerous opponent. The irony of the opposition to business among some in the Democratic base is that a plausible case can be made that, at least on the national level, Democratic administrations have proven better for business than Republican ones. A future column will explore this proposition. Certainly, Scott Walker has proved inept at fostering business in Wisconsin.